The Quad Cities’ very own 1st Impression has staked their claim on Top 40 rock ‘n’ roll music. They feature music from classic and current rock artists such as; Aerosmith, Journey, Guns & Roses, AC/DC, Nickelback, Fall Out Boy, Maroon 5, Halestorm with a few of their own original songs in the mix! 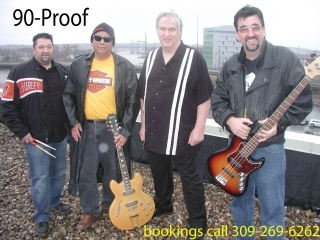 1st Impression performs to packed venues in the Quad City area and throughout the Midwest. They have opened for nationally touring bands such as Quiet Riot, Dokken, Warrant and have performed alongside artists like Pat Travers and Jackyl. The band is known for their top notch musicianship, along with stellar four-part harmony vocals, always offering a high quality show from start to finish! The band has produced two original CDs and plans on recording more in the future. 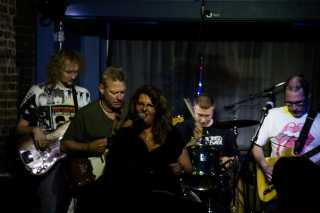 Established in 1999, founding member Becky Anson, named the band 1st Impression all those years ago. Known as the “Front Man” of the band, she maintains a personal connection with the band’s following by sending emails, texts and phone calls to “fans”, reminding them of upcoming event dates. 90-Proof from the Quad Cities, 4 piece Classic Rock/Country band featuring 4 unique players from the Quad City area. High Energy Classic Rock and Country. 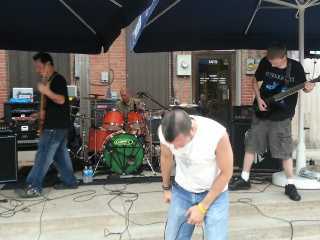 The Archimedes Death Ray, a heavy metal band, first formed in 2007, in Davenport, IA, consisting of only a singer, a drummer and guitarist. A few years would pass before a bass player was recruited, during which time a full length cd was written and recorded. After years of a constant line-up change, The Archimedes Death Ray is now Justin Kelly on drums, Ryan Denekas on bass, Zach Anderson on guitars, and Izzy Sutton(the only remaining founding member) on vocals. 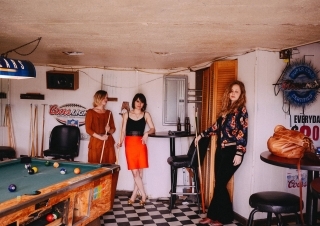 These Americana sirens hail from the banks of the Mississippi River and pair supremely-sonic harmonies with songwriting that examines relationships and the human condition. Naming themselves after the first letter of their names, BEEs formed in 2017 when friends Bethann Heidgerken, Erin Moore, and Esme Haferbier were hanging out and enjoying each other's company. Although they initially met through connections in the Quad Cities magnetic music community and their involvement with other music projects, they found their way into each other's lives and realized quickly that collaborating was in their near future. One night, in Erin's basement, amidst much laughter and cerebral conversation, the three women began sharing some of their original songs and discovered that their combined voices sounded remarkably beautiful together. While each woman is a songwriter and musician in her own right, it is synergistically through the blending of crystalline and soulful voices that they tap into dormant magic. Forming a band full of authentic musical chemistry that is compelling to a wider audience is as much a crap-shoot as it is luck of the draw. But getting to create that magic with your best friends? That is a miracle. EP, "Shady Lady", released February 24th, 2018! "Shady Lady" was recorded by the one and only Pat Stolley at Future Apple Tree Studio in Rock Island, Illinois and Mastered by Jeff Konrad. We are especially grateful to our friends and fans: thank you for showing up and sharing the magic with us. We can't do it without you! 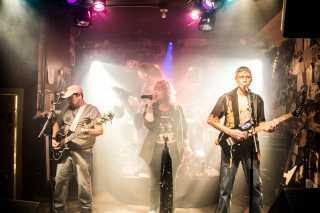 The Binjers are a band that plays popular rock covers from the 70's to today, with some originals thrown in for good measure. Formed almost overnight in late 2014, The Blacklights took on a life of its own. Solo keyboardist/vocalist EmJay and bassist Beej Dillard were in the midst of another creative project when EmJay was asked to play a solo set at a well-known music venue and event. Nonchalantly, she threw the idea out to work up a few songs together, and The Blacklights were formed. 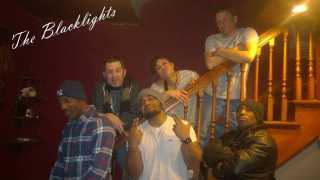 Joined by Matt Agjishigiri (drums), Brett Stanton (guitar), Sam Carothers (guitar), Solo Shaner (percussion) and Otis Holmes (vocals), the Blacklights continues to grow and gain momentum. The idea behind this band was to create an ego-free environment where all players can feel welcome to share working ideas. We had all been in bands before and had experienced ego-centric situations where good ideas would go unnoticed. The band that writes together, stays together. We break bread and share ideas... When a few of us move on to be grown ups, the band will continue to grow and evolve for the second generation. We are a collective, a family of creative beings meant to marry the sound of classic soul, neo-soul, funk and indie rock in this community. 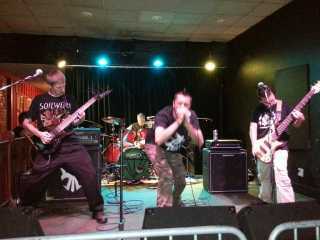 Our music grows with the scene around us! If you don't come see us, you'll never find out what Steve's special purpose is! We celebrate traditional country music, values, & lifestyles. 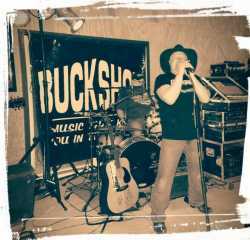 We play outlaw and classic country! All are previous members of Trent Avery & Buckshot. Most were members of The Bandits before that. Nearly 20 years of defending country music live in Illinois & Iowa! We are determined to give folks a REAL country alternative to enjoy live music in our neck of the woods! No teenage radio stuff here...this is the real deal...hold on! We celebrate traditional country music, values, & lifestyles. We enjoy outlaw & classic country. New top 40 is not a true representation of this great genre. We encourage folks to search for new traditional artists like Sturgil Simpson & Jaimie Johnson for a better understanding of country music. We have lived it and we will show that when we entertain you! We are interested in traditional country, raising hell outlaw country, having fun entertaining friends, and blowing off steam with an occasional drink or two! Cocktails in the Village of East Davenport led to repeated get-togethers and weeknight basement jams for Erin Moore Waterman, Maureen Carter, and Amy Falvey. In late 2011, the trio officially declared itself “a band” and embarked upon a journey to create original music and begin recording an EP. 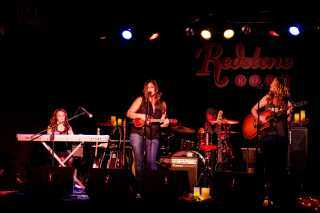 And in early 2012, longing for back beat, they welcomed Erin Marie Bertram to the band. Having appeared at Rozz-Tox, Bent River Brewery, the Redstone Room, and elsewhere, Busted Chandeliers are an inchoate but oftentimes compelling mix of earthy folk-rock stylings accompanied by keys and ukulele, traces of harmonica, fancy claps, and soulful honest lady vox.